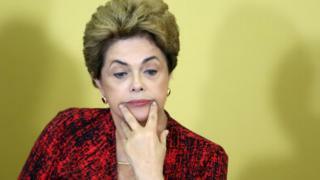 Image caption President Rousseff says impeachment process amounts to a "coup"
An impeachment process against Brazil's President Dilma Rousseff appears to be back on track after the acting speaker of the lower house revoked his surprise decision to suspend a crucial vote. Speaker Waldir Maranhao did not give any reason for his U-turn, which came less than 24 hours after he had called for a new impeachment vote. The Senate is now expected to vote on Wednesday on an impeachment trial. If Ms Rousseff loses, she will be suspended for the trial's duration. She faces allegations that her government violated fiscal rules, which she says is a common practice in Brazil. Mr Maranhao's earlier decision to annul the lower house vote held on 17 April had thrown the impeachment proceedings into disarray. Mr Maranhao argued there had been irregularities during the lower house session. Members voted overwhelming in favour of the impeachment process going ahead. He said members of the lower house should not have publicly announced their positions prior to the vote, and that it had been wrong of party leaders to instruct their lawmakers how to vote. The controversial decision added a dramatic twist to Brazil's political crisis. Markets were quick to react: Brazil's currency fell by 4.6% before recovering slightly. The Ibovespa stock benchmark fell by as much as 3.5%, reflecting investors' dislike of Ms Rousseff's Workers' Party policies, which they view as interventionist. But the decision mainly caused confusion as to what would happen next, and if a Senate vote on impeaching Ms Rousseff would go ahead as planned on Wednesday. Senate Speaker Renan Calheiros said it would and accused Mr Maranhao of "toying with democracy". His speech was met by both boos and cheers by senators divided on the issue. Then, late on Monday, Mr Maranhao released a statement in which he said he had revoked the annulment. He did not cite any reasons. Brazilian media reported that he had come under pressure from his centre-right Progressive Party, which threatened to expel him if he did not change his stance. This latest twist in the impeachment saga has dominated headlines. Mainstream media is critical of the chaos caused by Waldir Maranhao. Right-leaning newspaper O Globo describes the events as a "political hurricane", while regional newspaper Diario Catarinense features an article entitled "Waldir Maranhao and the circus of national embarrassment". However some media outlets are focusing on what made Mr Maranhao change his mind. Centre-right daily Folha de Sao Paulo writes that Mr Maranhao "feared" losing his mandate should he not revoke the decision, and left-leaning Diario do Centro do Mundo says that the lower-house speaker was "pressured". The events also sparked reaction on social media. Lawyer and journalist Emerson Damasceno (@EmersonAnomia) writes on Twitter that Mr Maranhao "will be remembered as the guy that angered the Greeks and the Trojans on the same day". Mr Maranhao has not yet spoken publicly about his change of heart. He had defied his party before when he voted on 17 April against the impeachment process going ahead. He only took over as speaker of the lower house last week. The previous Speaker, Eduardo Cunha, was suspended. after allegations he obstructed a corruption investigation. The Senate now looks set to vote as originally planned on Wednesday. In order for the impeachment trial to go ahead, a simple majority will have to vote in favour. If the Senate votes in favour, Ms Rousseff will be suspended for the duration of the trial and Vice-President Michel Temer will take over as acting president. At the end of the trial, senators will vote on whether they find Ms Rousseff guilty or not guilty. A two-thirds majority is needed for her to be found guilty and to be banned from public office for eight years.